Rod Stewart was the first concert I ever attended, and on December 11 I saw him live for the fourth time. As always, he put on a terrific show. While not quite as powerful as it was back in the 1990s, Rod’s voice still sounds great and he knows how to wrap himself around a song and convey emotion like very few singers do. 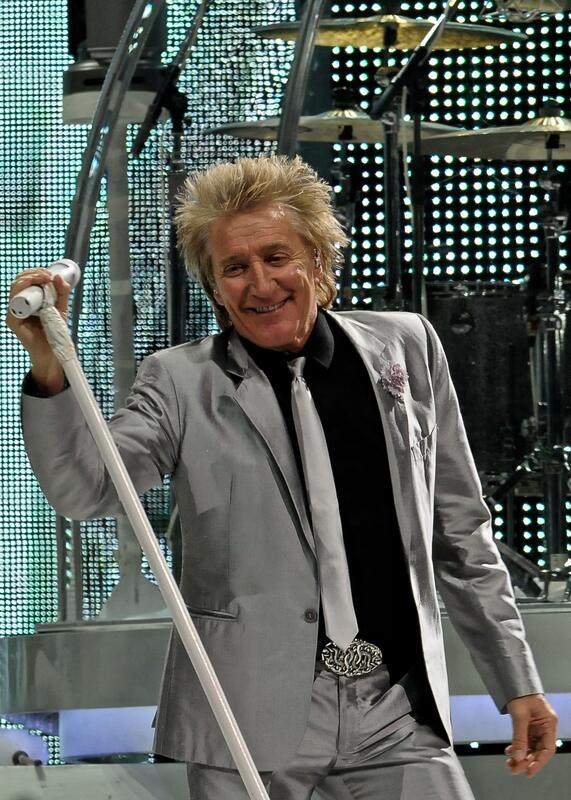 He also jumped, danced and kicked soccer balls around the stage – dressed in dapper attire, of course – with such energy and enthusiasm that it’s hard to believe Rod’s almost 69. Steve Winwood opened the show with an unremarkable set list that included only two hit songs: “Gimme Some Lovin'” and “Higher Love.” He didn’t perform “Valerie,” “Back in the High Life Again,” “While You See a Chance,” “Roll With It,” or “The Finer Things.” When you’re an opening act, you have to knock people’s socks off and give them what they want. Winwood did neither. Yes, he’s a great musician and performed well, but there was much left to be desired. Thankfully, Rod knows how to work a crowd and please his fans. He kicked off the show with two upbeat hits and rolled into classic material, including deep cuts like “Sweet Little Rock & Roller” and “I’d Rather Go Blind.” Rod also highlighted his new album, Time, with two great tracks: “Can’t Stop Me Now” and “Brighton Beach.” He also brought out his daughter, Ruby, to sing a song on her own, “Just One More Day,” and one with him, “Forever Young.” However, the highlight of the show was Rod singing “Have Yourself a Merry Little Christmas” while backed by an orchestral ensemble, with snow falling down from the ceiling. If you have a chance to see Rod Stewart live, go. He’s an iconic singer that still puts on an excellent show that won’t leave you disappointed. He had the crowd on its feet and kept everyone dancing and singing along from start to finish. He wasn’t inducted into the Rock & Roll Hall of Fame twice (once as a solo artist and the second time as lead singer of the Faces) by accident; Rod was honored two times because of his spectacular body of work and legendary live performances. Do yourself a favor and buy a ticket next time he’s in town. You’ll have a blast. Below is the set list from the show and four videos I shot. Enjoy! My wife and I were there, sec 112. Great show. Thought Steve was better than you say. He did Mr Fantasy and Low Spark, right? You may be right, I don’t recall. However, since Steve Winwood had such a short set, I expected nothing but his biggest hits and didn’t get them. As a casual fan, I found the song selection, not his performance, disappointing.